You are currently browsing the archive for the Postgraduate research category. It is nearly that time of year again for the SAGES PGR Conference. May the 11th and 12th will see 17 third year students present their research to PGR students and staff from the whole school. There will also be posters and powerpoint slides on display from a total of 48 second and first year students. These presentations will be on a range of topics fitting into all of the University’s research themes; Prosperity and Resilience, Food, Health, Environment, and Heritage and creativity. This year in addition to these themes, the conference committee have also introduced sub-topics from the United Nation Sustainability Development Goals (SDGs). Many of these goals encapsulate key aims of research across the School and exemplifies the global outreach potential of our School’s research. These sub-topics include; Climate Action, Life on Land, Life Below Water, Responsible Consumption and Production, Clean Water and Sanitation, Good Health and Well-Being, Sustainable Cities and Communities, and Industry, Innovation and Infrastructure to name a few. Given the disparate topics of research covered in the Conference, the Committee have also invited two external speakers, to reflect the broad academic interests of our research community. We also wanted these talks to reflect different aspects of post-PhD life including securing post-docs, interacting with external and government bodies, and securing funding and grant money to fund research projects. Therefore, Dr Jess Neumann will open the conference on the Thursday morning. Jess completed her PhD in Woodland Biodiversity and Agriculture at the University of Reading in 2014, and currently has a postdoc position looking at whether improved meteorological forecasts lead to more skilful flood forecasts in the Thames at seasonal timescales. To close the conference on the Friday afternoon, Professor Naomi Sykes from the University of Exeter will join us. Professor Sykes’s work has focused on reconstructing bio-cultural histories with an emphasis on presenting her research in a palatable and creative format. She has collaborated closely with a range of non-academic organizations worldwide and has worked with the United Nations towards the sustainable development goals. We hope this year’s programme will be of great interest to our students and staff alike and showcase the interdisciplinary and world-leading research of our PGR community. 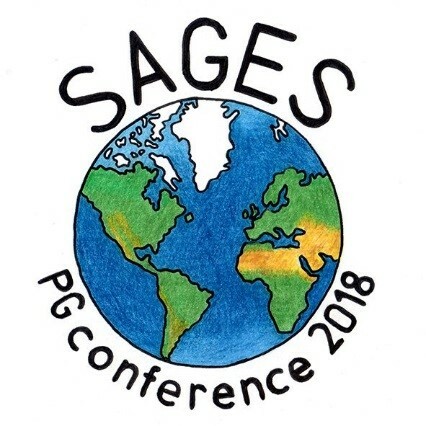 For further updates and information on the conference, follow #SAGESPGR18 on Twitter and read the abstracts of talks below. Congratulations to GES PhD students Anna Freeman and Rebecca Emerton for winning prizes in the 2016 Graduate School Research Image competition and Graduate School Research Poster competitions respectively. 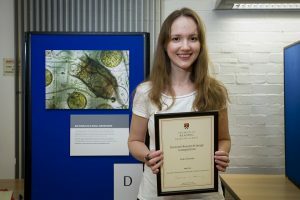 Congratulations to GES PhD student Anna Freeman (supervisor Andrew Wade), who won First Prize in the Graduate School Research Image competition 2016, for her entry ‘Big world in a small drop’, which featured a stunning microscope photograph of zooplankton from Farmoor reservoir, near Oxford. Anna received her award at the Graduate School Doctoral Research conference in June. Well done Anna! 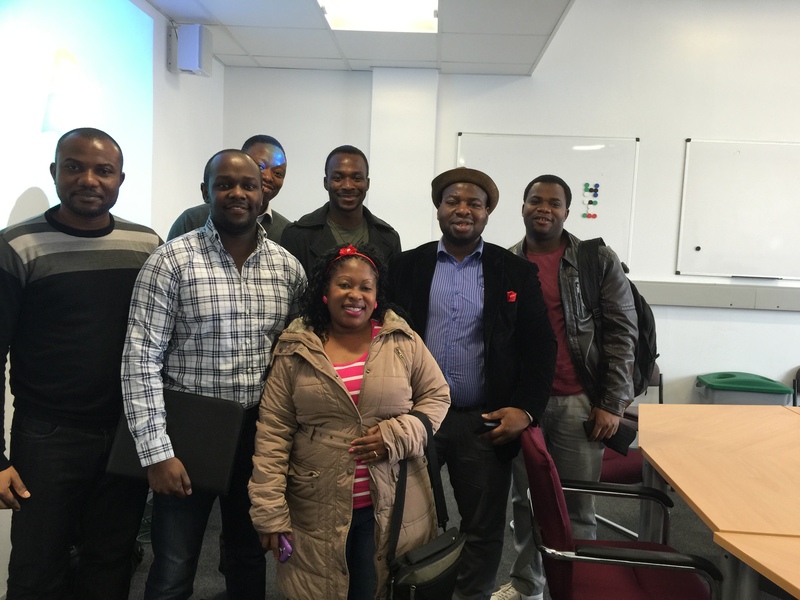 The University of Reading Graduate School Doctoral Conference 2016. 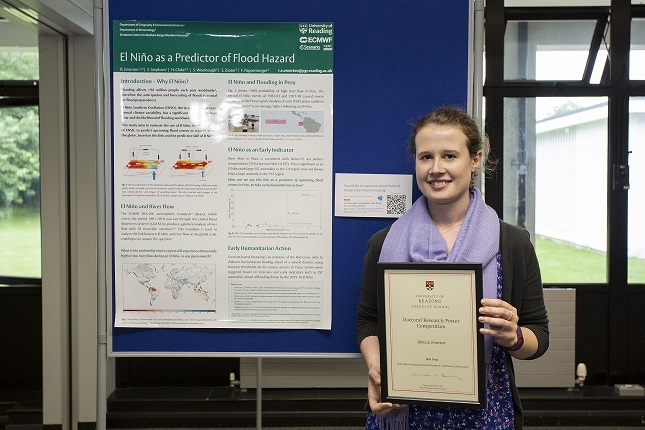 Congratulations to GES PhD student Rebecca Emerton (supervisor Hannah Cloke), who won First Prize in the Graduate School Research Poster competition 2016, for her poster entitled ‘El Nino as a predictor of flood hazard’. 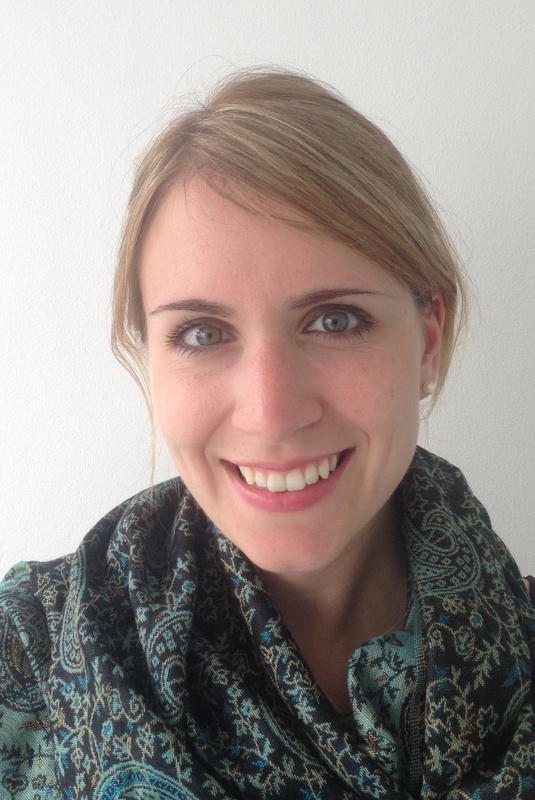 Rebecca received her award at the Graduate School Doctoral Research conference in June. The standard of posters in this competition was extremely high, but the judges were impressed by the clarity with which Rebecca was able to present complex science. Well done Rebecca! In the latter part of November 2015, one of the SAGES doctoral researchers, Saeed Abdul-Razak, had the immense privilege to deliver a presentation to kids of the Fulham Preparatory School in London. The presentation was on the ethical dimensions of climate change and sustainable development with over 120 students in attendance. The talk employed interactive approaches including videos (e.g. https://www.youtube.com/watch?v=eRLJscAlk1M), pictures and questions to the audience. The kids were introduced to the causes of climate change, development problems around the globe, the new 2015 -2030 sustainable development goals and the role of climate change in achieving these goals. There were case studies from Ghana on climate change mitigation (precisely REDD+) and climate change adaptation (for coastal communities) to explain the ethical implications of climate action. The ethical dimensions aspect of the topic was treated in light of decision making and processes between developed and developing countries at the international level; elites/authorities and citizens at national level; and for the community level, it focused on the vulnerable such as women, children, the poor, etcetera. The presentation concluded on a positive note by encouraging the students to go green, to think globally but act locally as the earth’s resources are finite and human action/inaction are important factors that impact everyone. 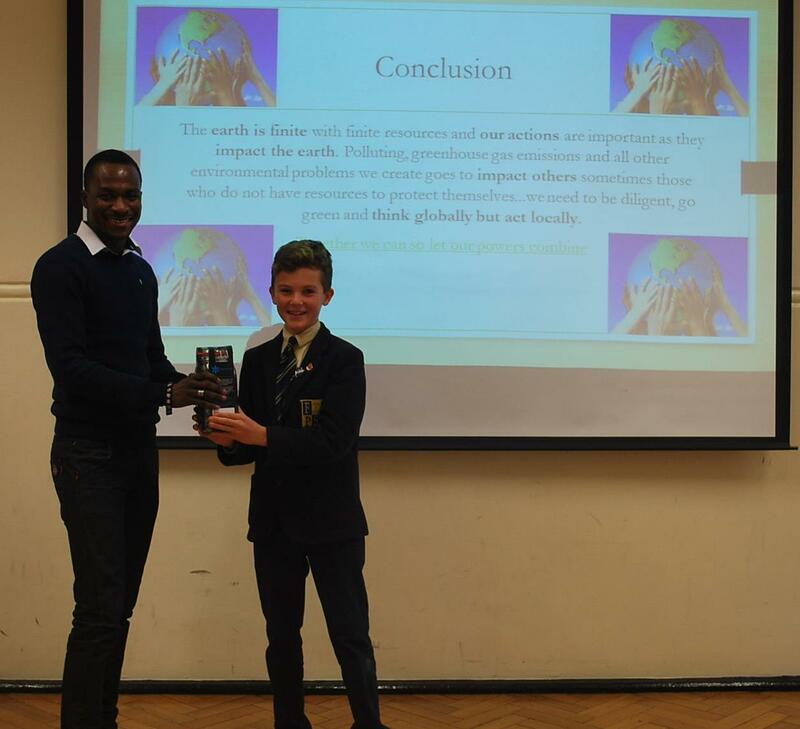 In appreciation for the talk, the school’s current head boy, Harvey Glover, presented Saeed with a jug of fair trade chocolates. 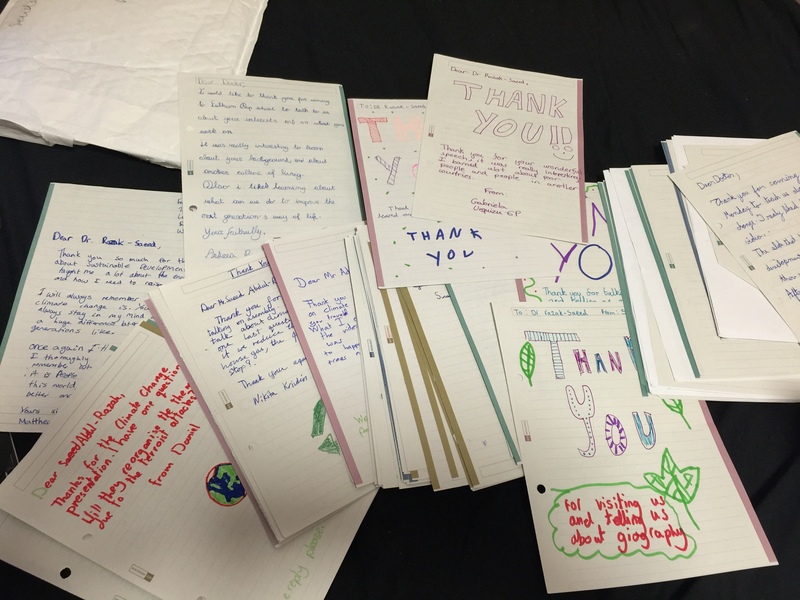 A couple of weeks after the talk, the kids wrote lovely letters appreciating the talk and Saeed’s time; some expressed their new inspiration to be green; others had follow-up questions and the remaining expressed how informative the presentation was and how they shared the new knowledge on sustainable actions with their parents, families and friends in order to ‘save the future’. On 14th July, Human Geography PhD students convened a workshop themed “Governing the Anthropocene: actors, institutions and processes.” As a first of its kind, the workshop brought together students from across the University of Reading whose research focuses on the environment, sustainability and development. 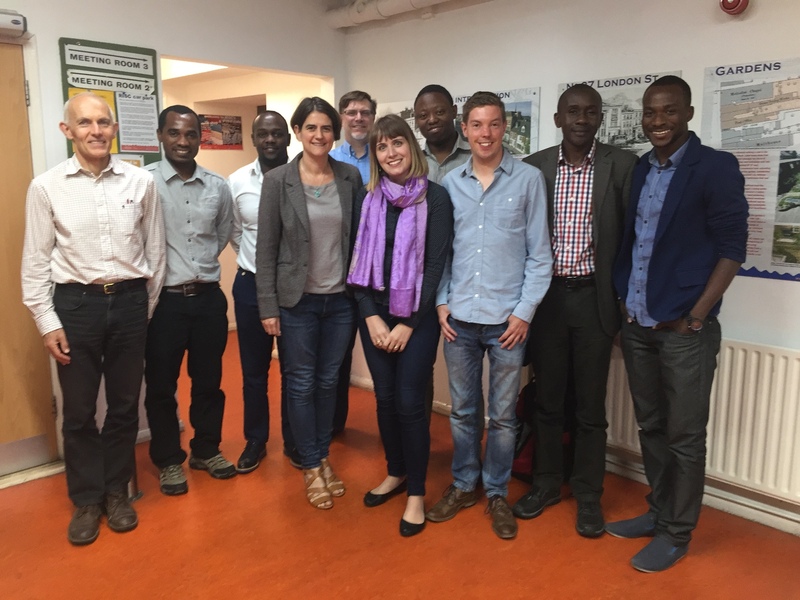 The workshop was an excellent opportunity for discussions, sharing ideas and networking amongst PhD students who attended. It also served as a friendly platform for constructive feedback on research works. The term “anthropocene” has made its way into the diction of scientists, researchers and academics, to refer to the current geological era. An era of profoundly different futures created for the global society, and far from anything previously experienced. The workshop focused talks on changing global environmental governance considerations, needed to meet the critical challenges of climate change, poverty, land use change, water and sanitation and deforestation. 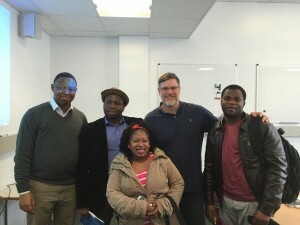 The full-day workshop, which took place at Reading International Solidarity Centre, brought together both conceptual and case study perspectives focusing on international to local scales. Country case studies of research presented were across the board from UK, Ghana, Nigeria, Kenya, Sierra Leone, Mozambique, Malaysia and Indonesia. The full workshop programme and presentation abstracts can be viewed here: GA workshop 2015. The nature and forms of participation, and it’s varied conceptualization as a means to an end or as an end in itself. The workshop culminated with a highly valuable and interesting discussion on ways forward. It was obvious that progressive and transparent policies are required at multiple levels to bring about meaningful change, and that the public has a role in requesting change from policy makers. This can only be achieved when the public is motivated and politically engaged on issues such as climate change that otherwise would be viewed by individuals of the public as huge and external to do anything about. In addition, it was noted that PhD students should strive to capitalize on avenues that bridge the gap between their academic research and policy/practice. 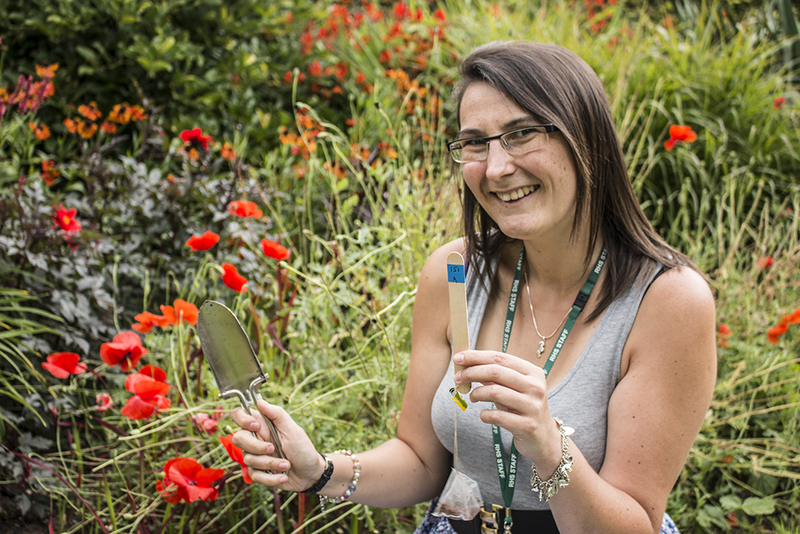 This week University of Reading and Royal Horticultural Society (RHS) PhD student Sarah Duddigan has been filmed for an Austrian children’s science TV programme, talking about her contribution to a decomposition rate citizen science project, known as the Tea Bag Index – UK. The Tea Bag Index is a novel method to measure decomposition rate in soil. Decomposition (the breakdown of organic material into its smaller constituents) is an important process for the release of nutrients into soil for plants to use. Therefore gaining a better understanding of decomposition in soil will be of great value to gardeners in the UK. The method is simple, UK participants are recruited through the RHS and posted some tea bags to bury in their garden. After three months they dig them up and send them back, along with a soil sample. Decomposition of organic matter (i.e. dead plant and animal remains) in soils is an important process in any ecosystem. Decomposer microorganisms feed on the organic matter and break it down into its simplest components. As organic matter is decomposed, water, carbon dioxide and nutrients are released. Meaning that, any excess nutrients are released and are available for plants to use to grow. Maintaining a healthy and vibrant garden is the aspiration of most gardeners and healthy fertile soil is a key component of this. 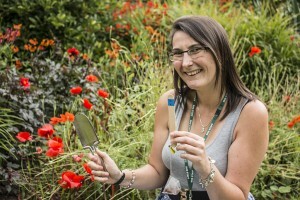 Therefore, a better understanding of decomposition rates in garden soils will be of great value to gardeners across the UK. While having an active microbial population decomposing organic matter is important for soil health, they are not without their problems. While organic matter is decomposing, it releases the greenhouse gas carbon dioxide (CO2) into the atmosphere. A fast decay leads to more CO2 in the atmosphere and slow decay could lead to a greater proportion of carbon remaining in the soil. It is estimated that soils store a gigantic 2,300 billion tons of carbon worldwide; triple the amount than all the worlds plants. Therefore in order to gain a better understanding of global CO2 emissions from soils it is vital to know more about the rate of decomposition. The data from the UK therefore can also be combined with data being collected across Europe (or across the world in fact) in order to gain a better understanding on the role of decomposition in global carbon emissions and the contribution to climate change. This seems to be a contradiction, on the one hand decomposition is good for plant health, but on the other has the potential to contribute to climate change. This is why projects such as this, which aim to gain a better understanding of decomposition rates in soil, are so important. Peter Mcmanners, who is a member of the HERG Resilience Research Cluster, presented a seminar to geography students on private sector resilience. 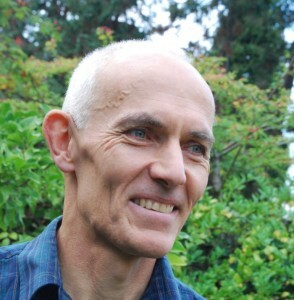 He outlined the significance of sustainability in the context of a business response. The underlying rationale for the private sector to engage with sustainability was explained. He also pointed out the limitations on business to apply their capabilities to fashion significant change to the way they operate. Business is constrained by investors with short time horizons and an overall expectation placed on business to focus on bottom-line performance. Many of the changes required in society and the economy, to deliver sustainability and resilience, have the characteristics of long-term systemic change. This is something we are not very good at. The culture of short-term results is not conducive to the long-term strategic planning required to deliver a resilient economy alongside a sustainable society. Current research into sustainability in aviation was used to discuss private sector resilience within a particular case study. This exposed a policy stalemate where the aviation industry is held back and unable to advance towards a low emissions future. There is the potential for a bright future for aviation but it requires radical change. In a global highly regulated industry with substantial sunk costs there is little appetite for transformational change. Current research into a new model for aviation was outlined and discussed with different passenger segments based on the premise that flying slower could be the catalyst to develop a new generation of low-carbon air vehicle. Finally, the seminar returned to the big picture of the global economy and an examination of the macroeconomic policy which sets the context within which business operates. Discussion was around whether economic globalisation will continue of whether the imperative of resilience will be the driver towards a more proximized economy. The seminar did not arrive at a definitive conclusion but raised the possibility of a transformation in macroeconomics to provide business with a different macroeconomic framework within which to operate. As sustainability and resilience rise up the policy agenda, we are likely to see much more consideration of transformational change as policy makers accept that the current state of affairs cannot continue indefinitely. If the private sector is to play an active role in such a transformation, it will have to be part of a wider initiative orchestrated by politicians and policy makers. The seminar was a thought provoking session which produced lively discussion and debate. For further information: McManners, P. (2014) ‘Reframing economic policy towards sustainability’, Int. J. Green Economics, Vol. 8, Nos. 3/4, pp.288–305. 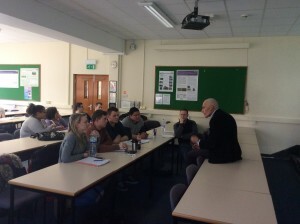 Last week 18 Early Career Researchers (ECRs, PhD and Post-Doc) from both FFIR programmes (FRANC and SINATRA) met for the first ECR meeting hosted by the School of Archaeology, Geography and Environmental Science, University of Reading (20th & 21st January, 2015). Each ECR gave an 8 minute presentation on their work and how they might interact with other members of the programme. This was the first opportunity for ECRs from both projects to present to one another, and as a result a number of potential collaborations and interactions were discovered. The presentations showcased a number of new datasets being created, either catchment specific data, rainfall data or emergency response/human loss data. This highlighted a number of potential users within the programme, and hence a number of interactions between ECR. The presentations also showed the diverse range of activities being undertaken to answer the problem of Flooding From Intense Rainfall. On the second day there were breakout sessions to discuss potential further interactions and collaborations, with a strong emphasis on sustaining the collaboration between ECRs. A number of potential joint publications were discussed as well as ideas for the next ECR meeting, forums and progress updates to keep the ECR community working together. Congratulations to Aroa Garcia-Suarez (PhD student in Archaeology) and Izabela Stacewicz (PhD student in GES), who have made successful applications to the first annual Rob Potter Memorial Overseas Travel Award. Both Aroa and Izabela have each been awarded £500 towards overseas fieldwork in 2014/2015. This is the first year of this award made in honour of the former Head of School, Professor Emeritus Rob Potter (1950 – 2014). For more information about Rob’s academic achievements, and details on the application process for the Overseas Travel Award, please visit the webpage.